On this blog I regularly follow the progress in dark matter building. One reason is that next-to-nothing is happening on the collider front: Tevatron invariably confirms the standard model predictions up to a few pathetic 2 point null sigma bleeps now and then. In these grim times particle theorists sit entrenched inside their old models waiting for the imminent LHC assault. The dark matter industry, on the other hand, enjoys a flood of exciting experimental data, including a number of puzzling results that might be hints of new physics. One of these puzzles - the anomalous modulation signal reported by DAMA - continues to inspire theorists. 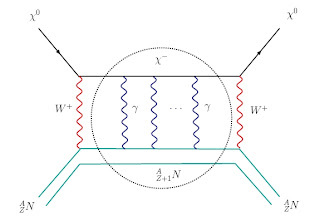 It is a challenge to reconcile DAMA with null results from other experiment, and any model attempting that has to go beyond the simple picture of elastic scattering of dark matter on nuclei. The most plausible proposal so far is the so-called inelastic dark matter. Last week a new idea entered the market under the name of resonant dark matter. 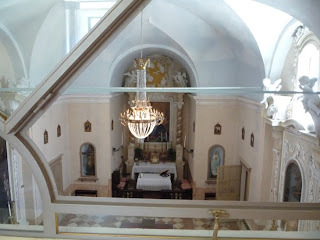 Since this blog warmly embraces all sorts of resonances I couldn't miss the opportunity to share a few words about it. In the resonant dark matter scenario the dark matter particle is a part of a larger multiplet that transforms under weak SU(2). This means that the dark matter particle (who as usual is electrically neutral) has partners of approximately the same mass that carry an electric charge. Quantum effects split the masses of charged and neutral particles making the charged guys a bit heavier (this is completely analogous to the $\pi_+ - \pi_0$ mass splitting in the standard model). Most naturally, that splitting would be of order 100 MeV; some theoretical hocus-pocus is needed to lower it down to 10 MeV (otherwise the splitting is to large compared to nuclear scales, and the idea cannot be implemented in practice), which is presumably the weakest point in this construction. Now, when dark matter particles scatter on nuclei in a detector there is a possibility of forming a narrow bound state of the charged partner with an excited state of the nucleus, see the picture. That would imply that the scattering cross-section sharply peaks at a certain velocity corresponding to the resonance.The existence of the resonance is very sensitive to many nuclear parameters: mass, charge, atomic number and the energies of excitation levels. It is conceivable that the resonant enhancement occurs only for one target, say, iodine present in DAMA's sodium-iodine crystals, while it is absent for other targets like germanium, silicon, xenon etc. that are employed in other dark matter experiments. For example, the resonant velocity for these other elements might be outside the range of velocities of dark matter in our galaxy (the escape velocity is some 500 km/s so that there is an upper limit to scattering velocities). So, that looks like a perfect hideaway for DAMA, as other experiment would have a hard time exclude the resonant dark matter hypothesis in a model independent way. Fortunately, there is another ongoing dark matter experiment involving iodine: the Korean KIMS based on cesium-iodine crystals. After one year of data taking the results from KIMS combined with those from DAMA put some constraints on the allowed values of the dark matter mass, the position of the resonance and its width, but they leave large chunks of allowed parameter space. More data from KIMS will surely shed more light on the resonant dark matter scenario. 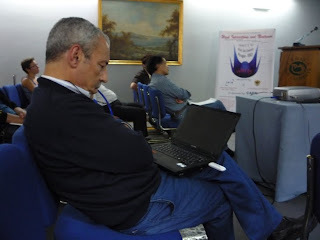 and there are many more similar ones stored on my disc ;-) Of course, the interesting point here is not sleeping during a talk - everybody does that. The remarkable point is perfect balancing of a laptop while sleeping. In the extreme case it went on for 45 min without awaking and without dropping the laptop to the floor. Amazing! 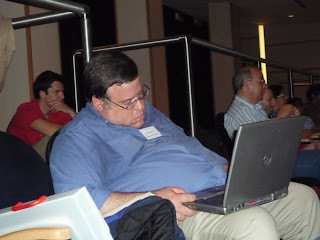 Using Darwin's theory of evolution one can predict that this new skill will quickly spread in the scientific community.Those who do not possess it will inevitably destroy their laptops while sleeping at conferences, thus losing years of work and dropping in the academic ranking. As a consequence, these handicapped ones will acquire less mating partners and thus less chances to pass their genes. Unless laptops become shock resistant in the meantime. It striked me as a really good idea. They say that science and religion cannot go hand in hand, but that's obviously not true. Take the first example in a row: the Higgs searches at Tevatron. 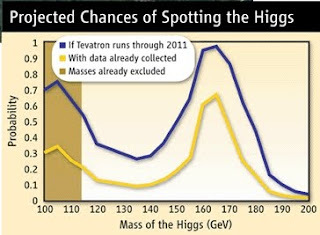 According to the plot on the right, Tevatron has roughly a 30 percent chance of finding a 3 sigma evidence for the Higgs in the most interesting region between 115 and 130 GeV. Since we speak of chances the matter is open for prayers. Therefore chapels should be available not only at conferences but also at every accelerator facility. And, as usual, gods will cast dice to decide whose requests should be granted.